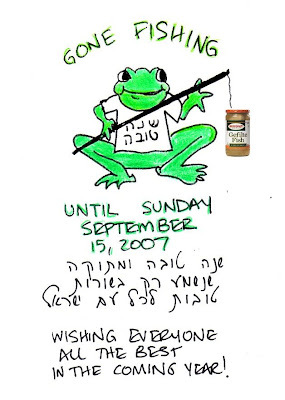 Please note: this blog will be closed for the Jewish holiday of Sukkot, from the afternoon of Wednesday, September 26, 2007 until after dark on Saturday night, September 29, 2007.
by Juggling Frogs at 10:55 AM 6 comments, so far. Add yours now! These were laminated with self-adhesive laminating sheets. We used to hang them from our sukkah's canvas walls with large stainless steel safety pins. The grommets were a later adaptation. They have held up well over the years. Here is a chain that holds many fusible bead projects of varying vintages, hanging from clear plastic lanyard. Have you noticed I like using chain? 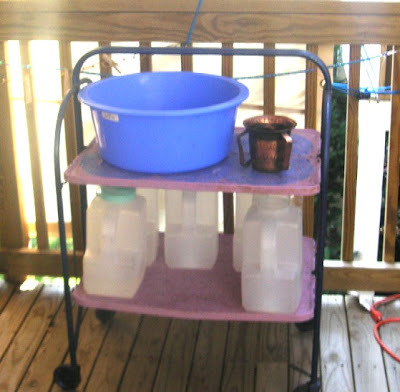 It is sturdy, relatively inexpensive, and you can get it cut to size at the hardware store. It's easy to measure by links how far apart the projects should be, and it's very expandable. Be sure to get coated or stainless steel chain, so it won't rust in the rain. Projects can be added easily in subsequent years, enhancing how it looks, minimizing space, set-up and take-down time. gazillions of items, and someone else made only a few, it's still their project together. I find it remarkable how the children remember which items they made, and seem only to see their own work! At the top of the picture to the left is a clear piece of packing material. I think it came from a thumb drive. Abigail (who was 8 at the time) strung beads in the Hebrew letters that spell "Sukkot", and we glued them to the clear plastic with a glue gun. The package conveniently came with holes for hanging on pegs in the store. Rabbi Yehoshua ben Levi asked, "How is [then nation of] Israel like an olive tree?" [He answered,] "Just as the olive tree does not shed its leaves both in Winter and Summer, so will [the people of] Israel endure both in this world and in the the world to come." It's hard to see in the picture, but the lettering on this banner (and many of the others) is painted with metallic fabric paints. If you can get them, they make for a very nice effect. Since the metallic paint in the letters reflects light, they sparkle in the lights of the sukkah at night. Since we invite our imaginary friends, the Ushpizin, into the sukkah, we thought we should invite the ladies, too. These are pomegranate cut-outs made of wood, available from Shulamit Ron, that we painted and then wrote names of the Matriarchs and Prophetesses. They are connected by craft wire strung with beads. We included Sarah, Rivka, Leah, Rachel, Devorah, Miriam and Ruth. Since this isn't a "real' tradition, I figured there are no rules, and just picked seven ladies. 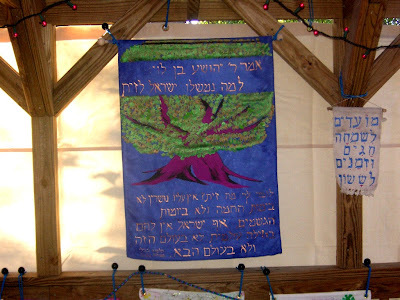 Below the "Ushpizot", there is one of the tie-dyed dinner napkin mini-banners, described in the previous post. 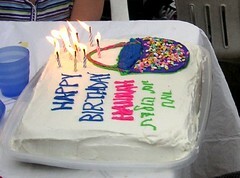 It has a rainbow, and has the words to "Osheh shalom..." on it, and a picture of a dove with an olive branch. In Boston, Jerusalem is to the East. 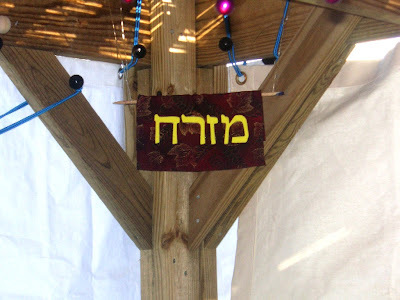 This "Mizrach" (Hebrew for "East") sign is on the Eastern corner of the Sukkah. Both the "hem" and the letters were affixed with a glue-gun. Here is (yet another) banner. "כִּי יִצְפְּנֵנִי, בְּסֻכֹּה בְּיוֹם רָעָה: יַסְתִּרֵנִי, בְּסֵתֶר אָהֳלוֹ; בְּצוּר, יְרוֹמְמֵנִי. " He lifts me up upon a rock." by Juggling Frogs at 3:17 PM 2 comments, so far. Add yours now! I have received many requests for Sukkah projects in the past two weeks. 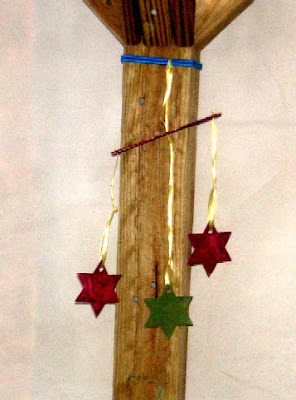 Now that our Yom Kippur machzorim (holiday prayer books - here are my new favorite , my old favorite, and the one our shul uses) are put away, and our Sukkah is up, I can to share a few easy, inexpensive, fun, and somewhat water- resistant crafts for Sukkah decorating. Sukkot is a reminder of man's lack of control of the physical world, and his vulnerability to the weather. We leave the comfort of our homes to live (or at least eat our meals) in a hut with a leaf-roof (called, "scach") for a week. In order for the commandment to be fulfilled, the scach has to provide shade imperfectly, allowing a view of the stars at night. We're sheltered, yet open to the elements. When the weather cooperates, we enjoy our soup despite a few leaves falling in it, and in the company of neighborhood squirrels and yellow-jackets. When it rains, we're not obligated to stay in the Sukkah, but all the decorations and crafts are off-limits for handling. This means that the decorations will be subject to rain, wind, and (at least here in Boston) perhaps even snow. 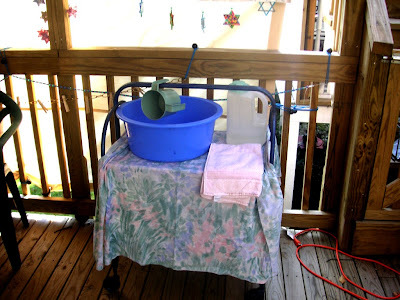 So, while we adorn the Sukkah with decorations, we need them to be waterproof and inexpensive, as well as beautiful. The holiday of Sukkot is also at the tail-end of a month-long marathon of holidays. It starts four days after Yom Kippur. In that time there is much to do: building the Sukkah, obtaining a lulav and etrog, cooking holiday food. Thus, home-made decorations need to be easy and not very time-consuming. 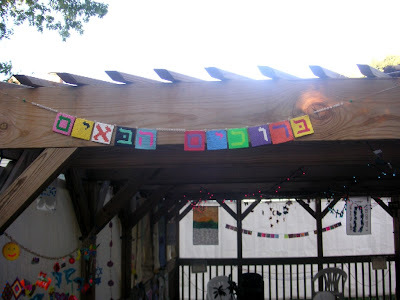 The challenge is to find Sukkah decorating activities that are cheap, easy, fast, weather-proof, beautiful, appropriate for the holiday, not too messy, and can be accomplished by groups of children with a wide age range. One strategy that works for our family is to use the summer to make some crafts for the Sukkah. This allows for more involved projects, and for paint to dry. In the summer, the days are long, and there is time to indulge in elaborate multi-step projects. This isn't always possible or desirable. 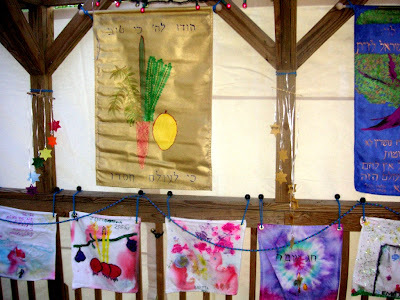 Often, we need to have Sukkah decorating art projects to make with large groups of children, either to decorate our synagogue's Sukkah, or as a classroom activity. Sometimes, we just want to have the projects made closer to the holiday to make it relevant for the children. Sometimes, we need to fill an empty space to replace decorations that were blown away or waterlogged last year. 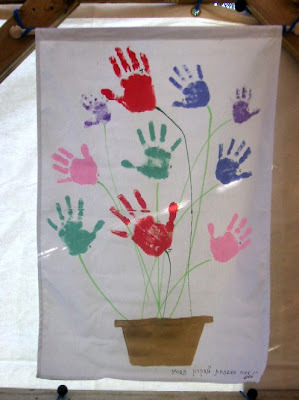 My favorite projects involve all the children, like this banner made from the kids' hand prints. It was quick and easy to make. To make it, let each child choose a color of fabric paint. Encourage them to choose dark colors that will show up at a distance. Don't forget to write the date in fabric paint! Six years ago, I bought this huge container of fusible beads for $11 . We have used them for more crafts than I can count, for community events, and for birthday parties. We still have half the bottle left! The beads are tiny colorful plastic tubes that melt when ironed. The system includes a rigid heat-resistant plastic plate with many tiny pegs. The beads are placed on the pegs, touching each other to the desired pattern. When the pattern is complete, a piece of wax paper is placed on top (gently and carefully) and the beads are fused through the waxed paper with the iron. They melt and fuse together in about a minute of ironing. I like to flip them over and fuse the back side as well. Don't forget to use the waxed paper in between the beads and the iron, or the iron will be covered in melted plastic, perhaps ruined. 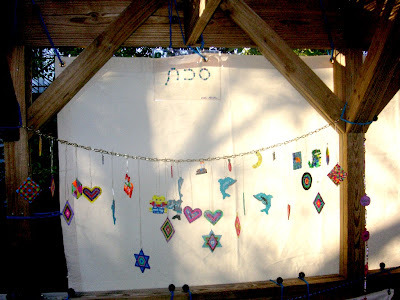 Crafts made with the fusible beads will stand up to many seasons in the Sukkah, exposed to the elements. To make the decorations easier to put up, remove, and store, it helps to invest some time attaching them to something else that hangs. Try to avoid using bare wire coat hangers, because they rust in the rain. 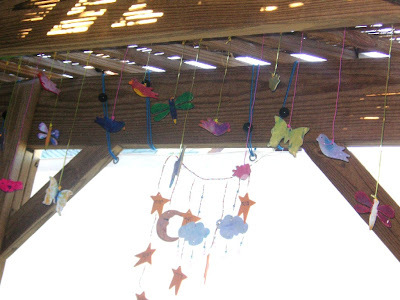 The stars in the picture to the left were made by different children over different years. At some point, I collected them, inserted a jump ring in the top, and strung them with plastic lanyard. To keep the stars evenly spaced from year to year), thread the plastic lanyard through a pony bead, then through the jump ring, then back through the pony bead. Hanging above that are painted wood shapes in the form of the moon and stars. These are available at craft stores for 10 cents to 25 cents a piece. Paint them, drill a hole at the top, and string beads on plastic lanyard to hold them. We put the Ushpizin names on the stars. For items painted with acrylic paint that you'd like to keep for multiple years, it can be helpful to spray them with fixative when they're dry. This will make rainwater bead up and not penetrate. If you choose to use the fixative, wear gloves. That stuff does not come off skin, even with most household solvents. Ask me how I know. Here is another set of letters, spelling out "baruchim HaBaim", or "Welcome". My son, Jonathan, made it when he was about 10 years old with the fusible beads. Here is a closer view of the painted wooden shapes. The top of each lanyard is threaded through a hole in the middle of the width of the ribbon, and secured with a square knot. The ribbon is hung at both ends. This allows a few dozen painted shapes to be hung (and removed) at once. It would take forever to hang them individually. It is fun to watch all these flying animals sway in the breeze. 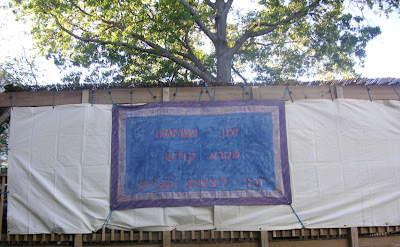 On the outside of our Sukkah we have a very large banner made from a tablecloth. It is 5' wide by 12' long. I call it the "Simcha Banner". The banner then was spray-painted blue over the message. When it was dry, newspapers were placed over the middle part, and the border was spray painted beige. After the beige border dried, the inside half was covered with paper, and the outer border was spray painted purple. Then all the papers were removed, including the letters in the middle message. The letters were filled in with bronze paint, and a bunch of biblical sentences about simcha were written in blue on the beige border. It's very hard to see, but the purple outside border was stamped all over with one of Shulamit Ron's stamps that says "moadim l'simcha". I put grommets all around, and voila! Every year, we try to make a few new permanent crafts for the Sukkah. However, the bulk of crafts made each year are not so long-lasting. The kids draw many pictures to adorn it, and we encourage them to do so. Here is where rain can be our friend. If every craft lasted forever, we wouldn't have room for a table! 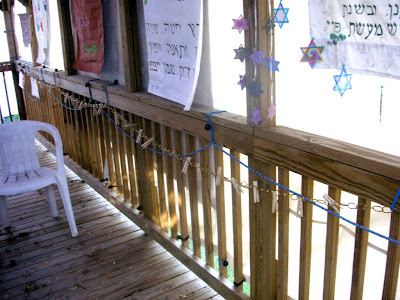 Something I've found very helpful over the years is chain, the length of the Sukkah, fitted with clothespins every third link. 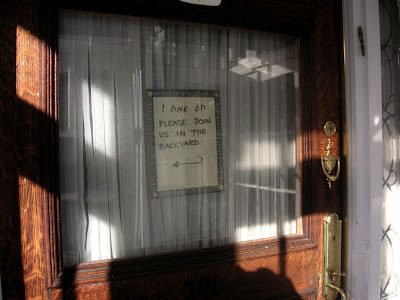 I attach it securely along the railing. A standard 8.5"x11" paper, held in landscape format, can be held with three clothespins. If held in portrait format, it takes 2 clothespins. This chain can hold all of the last minute paper decorations that the kids make. Since it is about 3 feet high, and since clothespins don't require adults or knots, the children can hang their own work. This helps a lot. Above the chain you can see the beaded chains. These were made by the children from pony beads (very inexpensive, waterproof, and easily for small children to manipulate, due to their large holes) strung on plastic lanyard. To make it long enough to drape, plan for the finished beaded length to be about 150% of the length it will reach. 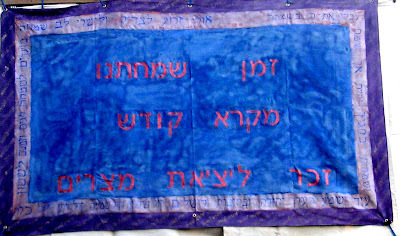 The banner that says "Ufros Aleinu Sukkat shlomechah" (Spread over us Your Sukkah/shelter of peace.) 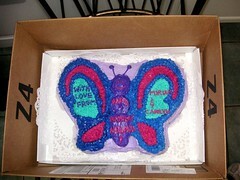 was made by a group of the children. We put paper-cut-out letters on the banner. Then they cut leaf shapes from kitchen sponges and sponge-painted over the paper letters in Autumn colors. When the paint dried, the paper letters were removed and the shapes that remained were outlined in fabric paint. Of course, the ultimate in one season use Sukkah decorations is the ubiquitous paper chain. 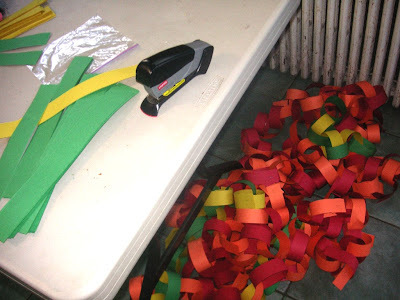 Every year, when I pack up the decorations after Sukkot, I prepare a bunch of 1.5" strips of construction paper, stick them in a bag, and place them on top of the decorations box. This way, the children will have at least one craft's materials prepared and ready to go as soon as we open the box next year. Believe me, if you do this, you will thank yourself next year. I hope to post a detailed tutorial for these recycled craft mobiles soon. These clear plastic shapes are then soaked in soapy water to decorate the Sukkah: remove the product label and a hole is punched on top. The horizontal bar is made from a Popsicle stick. Drill tiny holes in the Popsicle stick with an electric drill for the ribbons to thread through, and it will hold up to the wind nicely. The painted shapes are attached to the Popsicle stick with curling ribbon. The big gold banner in this picture has a picture of a lulav and etrog, and "Hodu L'Hashem Ki Tov, Ki l'olam chasdo." This is what we say when we shake the lulav during the Hallel prayer (hymns of praise) during the holiday. 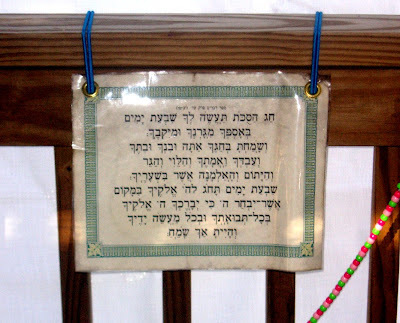 The smaller "banners" below, along the railing, were made from dinner napkins. 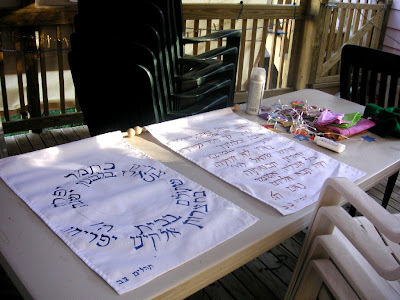 (For Jonathan's bar mitzvah a few years ago, it turned out to be cheaper, easier, and less frustrating to buy tablecloths and cloth napkins in bulk, than to rent them from a linen service. After the bar mitzvah, I washed them, and have used them for multiple other events since then. I hope to use them for the girls' bat mitzahs, too. These 20" square napkins are the perfect size for children to decorate with fabric paints, tie dye, etc. I set grommets in the top corners to make them easier to hang. Every year, we add to the inventory of these smaller banners. by Juggling Frogs at 2:18 AM 11 comments, so far. Add yours now! A 52"x70" vinyl tablecloth ($2 at the department store or $5 at the supermarket) for every two tables you intend to make. This gives the table some water resistance. We usually cover them with another tablecloth when they're being used at a meal. Option 1: Cut the tablecloth in half width-wise, resulting in two 52"x35" pieces. Option 2: Cut the tablecloth 30" from each end, resulting in two 52"x30" and one 52"x10" pieces. Option 1: Duct tape the tablecloth to the plywood. Option 2: Duct tape the tablecloth to the plywood. Then cut the 52" x 10" piece, and use it to wrap two or three of the bricks. This makes the bricks more aesthetic, and keeps them from crumbling brick-dust on the table. It also makes the bricks less likely to snag the tablecloth. Set the storage container's cover aside. We won't be using it. Place three bricks inside the upright storage container. Place the vinyl-covered luan plywood on top of the open container. Place two bricks on top of the "table". The three bricks in the container make it sturdy. The bricks on top of the plywood are not shown in the photo above, but should always be in place when these tables are used. Otherwise, the top will likely flip over when the children put pressure on it. 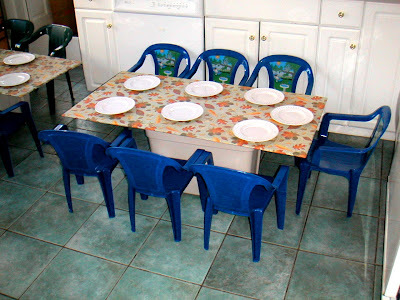 WITH THE BRICKS, we have used these "tables" for many birthday parties and as "kids tables" in our sukkah. We keep three or four of these "tables" in our basement. They store very compactly, as the storage containers stack, and the bricks and plywood fit inside. The last time I made them, was about four years ago. It cost under $20 to make 3 tables like these. Using the little plastic yard chairs (usually go on clearance at the end of the season for $3 each) we can seat 8 children at each table. The nicest part is that the storage containers can be re-purposed if you decide you don't need them for use as tables. by Juggling Frogs at 5:45 PM 4 comments, so far. Add yours now! by Juggling Frogs at 9:52 AM 17 comments, so far. Add yours now! by Juggling Frogs at 9:49 AM 7 comments, so far. Add yours now! (No, I'm not telling you which is which. I love you all the same. Now go clean your room.) Wondering how you got on this list? Maybe I just like you. 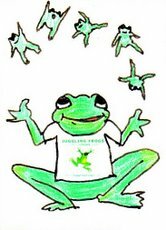 Are you a friend of Juggling Frogs? Let me know you'd like to join this list! by Juggling Frogs at 10:08 AM 8 comments, so far. Add yours now! by Juggling Frogs at 6:11 AM 2 comments, so far. Add yours now! by Juggling Frogs at 7:01 AM 0 comments, so far. Add yours now! by Juggling Frogs at 2:23 PM 1 comments, so far. Add yours now! by Juggling Frogs at 11:10 AM 3 comments, so far. Add yours now! by Juggling Frogs at 9:56 AM 2 comments, so far. Add yours now! This is an update for the FrankenDress post, because my fashion model was unavailable when it was written. by Juggling Frogs at 6:57 AM 4 comments, so far. Add yours now! Are you familiar with the Sesame Street song, "Monster in the Mirror" sung by the Grover (the hapless blue monster who speaks without contractions)? In the real lyrics by Norman Stiles, Grover sings, "Wubba wubba wubba, wubba wubba wooo". Here is a link to a video of Grover the Monster performing it. Chorus: He asked, "Won't you, mochel, mochel, mochel, mochel me? Mochel, mochel, mochel, won't you mochel me please?" He asked, "Mochel, mochel, mochel" so I asked him too: "Will you mochel me, and I will mochel you." Monsters: Will you mochel me? Please know I mochel you. Chorus: He went "Won't you, mochel, mochel" and I sang along, cause "Mochel, mochel, mochel" is a proper song. Monsters: "Mochel, mochel, mochel" is a proper song. Grover: He went, "Won't you, mochel, mochel" and I sang along, (instrumental music returns) 'Cause "Mochel, mochel, mochel" is a Tishrei song. Monsters: "Mochel, mochel, mochel" is a Tishrei song. Grover: Every mirror has a monster in it, do not doubt. This kind of situation does not call for freaking out. And do nothing that you would not like to see him do...'Cause that monster in the mirror, he just might be you! "Mochel, mochel, mochel", you can join in too. Please will you mochel me? And know I mochel you." Monsters: Will you mochel me and I will mochel you? Grover: In Tishrei, "Will you mochel me?" is the thing to do. Grover and monsters: Yes, please mochel us. We mochel you. Unidentified monster: (spoken) We mochel you. by Juggling Frogs at 11:07 AM 3 comments, so far. Add yours now! That's T for the Hebrew month of Tishrei. And 10, as in 10 days. Rosh Hashanah starts on the first day of Tishrei. This year (2007, or 5768, depending on which calendar you're using) it begins on Wednesday evening, September 12. Counting TODAY, there are 10 days left until Rosh Hashanah. What follows is my own non-exhaustive, imperfectly-edited collection of lists of things to freak out about consider before the Jewish ("high") holidays. I'm sharing them because it can be helpful to read such a list (not to adopt it completely, but rather) as a trigger to remember things that might otherwise fall through the cracks. The list items are in no particular order. If you don't find this type of exercise helpful, please move along. This is a ridiculously long post. Spiritual preparation is not in the scope of this message. The purpose of these lists is to focus on the physical stuff to clear our heads for the Big Stuff to come. (Disclaimers: Since this is my list, it is geared to our Ashkenazi, non-chassidic, yekkish (German-Jewish), orthodox family living outside-of-Israel (in the U.S.) Everyone's list will vary with their circumstances and customs. We're hosts, not guests. If you're traveling, there will be scads of other stuff to do, such as acquiring hostess gifts, packing, etc. Personally, I'd rather cook for a month than pack for a week. Please consult your local halachic authority about anything that differs from what you normally do. I'm not any sort of halachic authority. I don't even play one on t.v. I'm not trying to tell anyone (other than my recalcitrant self) what to do. My goal is to help those who want to do these things remember that the time to do them is nigh. Non-Jews are hereby invited to skip this post. Or you can stay and just smile and nod sympathetically like we do in December. Really, though, I can't imagine it holds any interest to those who aren't in this particular foxhole. Due to time constraints, I'm not going to translate the Jewish and Hebrew terms much. The OU.org website is a fount of legitimate and useful information, such as their Jewish Holiday Calendar overview. Starts Wednesday, September 12, 2007 before sunset, officially ends on Friday night, September 14, but since that coincides with Shabbat, it effectively ends Saturday night, September 15. We affectionately (yet inaccurately) call this phenomenon (when a two-day holiday gets extended due to its sharing a time border with Shabbat) a "Three Day Chag". Rosh Hashanah is two days long, even for those who live in Israel. With the exception of Rosh Hashanah, those who live in Israel celebrate only the first day of the double-day holidays. Thus, they are unaccustomed to the "Three Day Chag" situation, as it only comes up for them when Rosh Hashanah falls on a Wednesday night, as it does this year. Those of us who live outside Israel experience this more often. 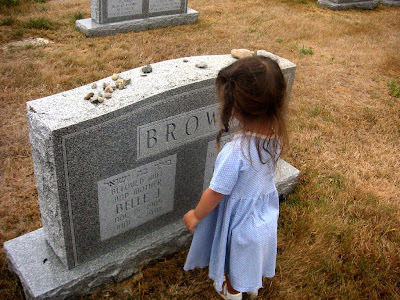 Start a list of questions to ask the Rabbi, even if you don't have any yet. Try to ask questions early, as his schedule includes all that we have to do, along with a dozen high-pressure, high-profile public presentations and a gazillion other details. If for whatever reason the questions don't get answered (or asked) before/during this Tishrei (for example, due to discovering a workaround that avoids having to ask), if they are written down, you can ask them next month, in preparation for 5769. If they're not written down, they'll fall victim to post-chag amnesia. Slichot!! Find the Slichot machzorim, put the date (depending on your minhag) on calendar. We have them this coming Saturday night, September 8, 2007. Find out the time - is it midnight? 11:pm? 1:am? I don't know why, but every year we forget this. Get the holiday schedule, including the shul's davening times entered on the family's calendar. Make sure the shul schedule is available in hard-copy somewhere public. Ours is in the reference binder on our refrigerator. Enter the candle lighting times onto calendar - especially if you use an electronic one. Prepare an Eruv Tavshilin on Wednesday, September 12, 2007 during the day. 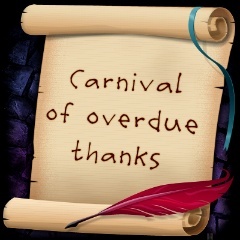 We won't have many weekdays this month, so it is helpful to pre-pay bills as much as possible, so they won't pile up. Look into chessed opportunities particular to the season - blowing shofar for hospital patients, inviting overlooked local residents (especially singles and those new to the area), delivering Yom Tov food, etc. 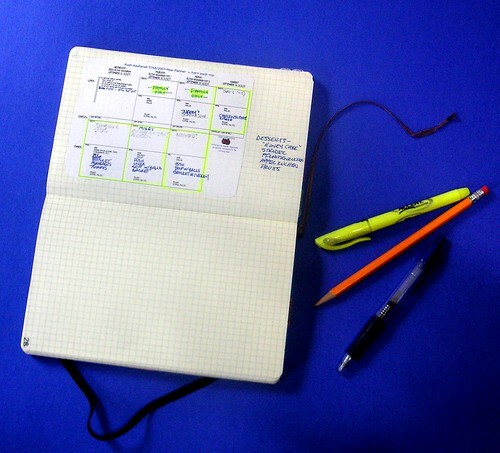 Schedule these now before the quicksand of the schedule buries the opportunities. Buy honey for baking and for serving. We dip the bread in honey for every Yom Tov meal from Rosh Hashana through Shemini Atzeret. This is a huge concession on the part of my husband, who considers honey a Class 3 Controlled Substance. He hates the mess. Even outside in the Sukkah. Note: This video was made by someone else, who has a better sense of humor than my husband when it comes to honey. A family tradition has developed around this, where the kids goad him on about it, with exaggerated reveling in this custom as though it were halacha. It is very effective: their eyes dance and my husband's jaw sets at the mere mention of honey. Buy or cut flowers for the table. 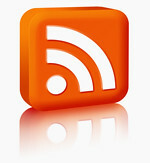 Get an article of new clothing or jewelry. Check that everyone has enough outfits and undergarments including new or at least run-free stockings!) that fit for three days of synagogue and company meals. Remember that the kids probably grew over the Summer. Inspect these clothes for missing buttons, stains, etc. Set them aside to minimize the day-of-chag screams of "Hey! 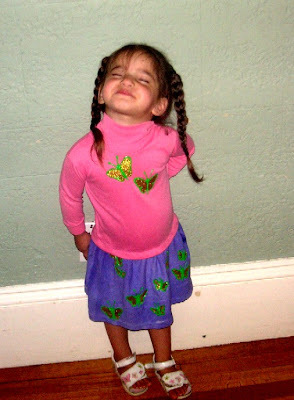 That was MY skirt. Who told you you could wear it today? ......EEEEEEma!" Dry cleaning submitted and picked up. Do you know where your (husband's) kittel is? Obtain whatever Simanim your family uses. Buy tons of eggs. Everything, including the eruv tavshilin will use eggs. Can always make egg salad or serve them hard boiled. Eggs last a while. Establish a set place for the onslaught of tzedakah mail that comes with this season. Either make special folder in your inbox for it, or, if you use a tickler file, pick a date to make decisions and write checks. Does the family need any new ones for kids who are newly old enough to read from them? I like to prepare my machzor with a few tissues tucked into the cover, and with a cloth napkin (because we bow to the floor, but not on a bare floor) for Yom Kippur. List of family members and friends to call and wish good new year/yom tov. Wednesday: Turn of alarm clocks! Also, might be able to think of a substitute/friend to borrow from/etc. if you realize it now and don't want to purchase or don't have the resources (energy, time, money, decision making skills....) to buy. Acquire hostess gifts. Stockpile a few extra bottles of wine and a few pareve treats (not nuts, just in case someone has the minhag/custom to avoid them on Rosh Hashana) just in case. Make a list of guests to invite. Invite them. Check supply of/iron/purchase/prepare table linens. Prepare any blog posts, e-mail messages or voice mail announcements to warn people you'll be unavailable for certain dates. 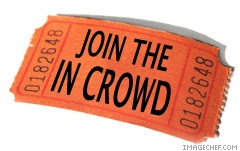 Purchase seat reservations at shul. Make provisions for kaparrot. Although in English that word contains 'parrot', we don't use birds at all just $. 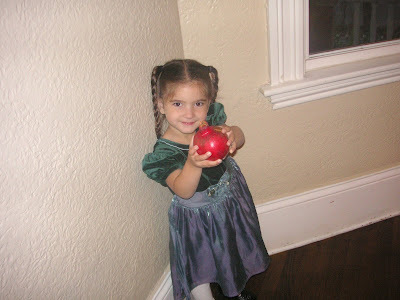 Arrange/pay for babysitting for Rosh Hashanah and Yom Kippur. 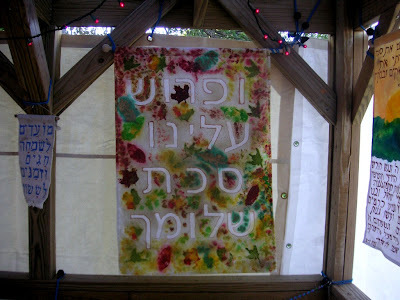 Any children's art projects made from now until Sukkot should be evaluated as potential Sukkah decorations. 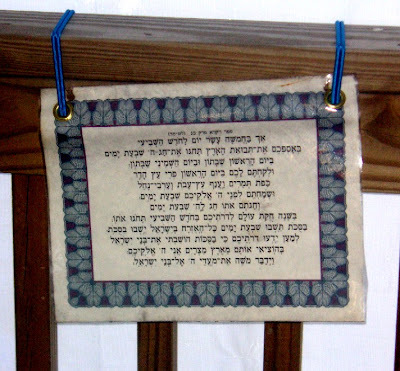 If there is a young child who doesn't attend school, make sure that child has a few pictures hung in the sukkah, so she/he won't be left out when everyone points out what they made. If necessary, anything can be 'laminated' by being slipped in a page protector. There should be something hanging in the sukkah from every child. Make a plan for tidying up (at least the public rooms) that doesn't require doing much on erev chag. This is a good time to have an empty inbox. That may not be realistic, but any extra moments spent toward this goal will be appreciated. Clean out refrigerator and freezer to make space for Yom tov cooking. Cook as much as possible before the date in advance. We don't use bread for tashlich, but if you do, you might want to set some aside. Can't hurt to have extra apples and honey and pomegranates, etc. to serve as emergency hostess gifts. Can always use them in salads if not needed. 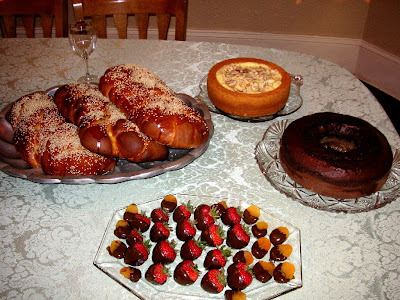 It's not a minhag, but we like to serve the 7 kinds at the Rosh Hashana table. We don't send cards, but appreciate those we receive. We display them on a shelf until sukkot, when they'll morph into sukkah decorations. Still helpful to have a few cards on hand, in case need to reciprocate with someone who would be put off by not receiving a card. Candles: Regular candles. In four weeks, have 10 candle lightings. Also check the stock of yartzheit candles both for transferring flame and for yizkor if necessary. (Thank G-d, we don't need them for this.) Have I mentioned there will be three 3-day chaggim chutz l'aretz? Think about the status of the sukka from last year. Is anything broken? Can it be ordered? Need new scach? Wednesday afternoon: Set cellphones, Blackberries, Palm pdas, and cordless phones up to charge, otherwise their power will drain over the next 3-4 days. 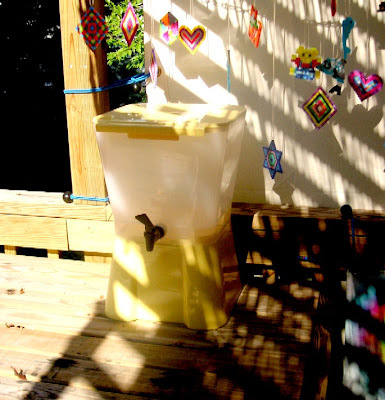 Wednesday afternoon: Run the garbage disposals before candle lighting time, so the sink drains will be empty and clear. Wednesday (sometime): Empty the answering machine/voice mail so it won't overflow over the break. Move the laundry to the dryer, leaving nothing in the washer to mildew over the break. Try to have at least one dish to prepare with the kids, so they have sweet holiday preparation memories and no false advertising about the level of preparation required to make a holiday work. Buy non-perishables NOW if haven't done so already. Also not a bad idea to have some emergency cake mixes, salad dressings, jarred sauces, etc. just in case homemade isn't possible. Stock the refrigerator and freezer with ingredients as much as possible. Try to do a bit each day. If you "do" GTD, try to get a weekly review done before Rosh Hashanah, but don't expect to do another until October. Brace yourself for October's to be a doozy. Starts Friday, September 21, 2007 before sunset, ends Saturday night, September 22. 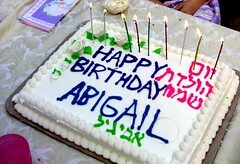 It's a special one this year, because it falls on Shabbat, although that has little impact on the preparations for it. Find the time to really ask a mechila from people - especially from family members, not just a quick question while running to shul on the way to Kol Nidre, but actual time to really ask and receive forgiveness from one another. Verify that everyone has non-leather shoes that fit. This can be a problem for the girls who wore sandals all Summer and their sneakers might not still fit. Mark on the calendar a reminder to drink a lot of water on the days before the fast. If you quit caffeine before fasting (to make it easier/avoid headaches) then write that reminder on the calendar, too. Make honey cake or a reasonable imposter for erev Yom Kippur, where we ask for it, in the hopes that it will be the only time that year where we need to ask for food. If you or a family member is pregnant, nursing or anticipates other health issues, ask the rabbi how to handle fasting, and how or when to break the fast if necessary. This one's a bit more complicated, schedule-wise. If you know the score, or if you don't care, I recommend skipping this explanation and its headache-inducing effects. Sukkot is technically seven days long, but it is always immediately followed by another (double-day-if-outside-of-Israel, work-restricted) holiday, called "Shemini Atzeret". This means that we can't take down the sukkah, write, shop, do laundry, etc. until after Shemini Atzeret. This makes Sukkot feel like it is nine days long for non-Israelis, and eight days long for those who live in Israel. Since the Israelis celebrate Shemini Atzeret in one day, that day is both Shemini Atzeret and Simchat Torah for them. For the rest of us, Simchat Torah is celebrated on the second day of Shemini Atzeret, the day that feels like the ninth day of Sukkot. But, really, there are only seven days of Sukkot. The 3rd through 7th days are also Sukkot, but these days are called "chol hamoed" (a somewhat oxymoronic term, meaning something like "everyday holiday days".) These days between the two sets of double-day-if-outside-Israel, work-restrictive holidays have their own rules. For jGTD purposes, the impact on the to-do list for these intermediate days is minimal. With me so far? Good. Then you're ready to kick it up a notch. It gets even more complicated. No, I'm not making this up. This year, however, the third day of sukkot is one of those Shabbat days that hugs the first two holiday days. And, this year, Shemini Atzeret's two days also bump right up into a Shabbat. Thus, there are two weeks of Wednesday night until Saturday night "Three Day Chags" this year. The 9th day of the whole Sukkot-Shemini Atzeret stretch end on Friday at sunset, when Shabbat begins. So, this year, Sukkot, which is always technically seven days long, seems like ten days long. Some people (inaccurately, but forgivably, because by then we're all exhausted) call these the "last days of Sukkot". So, for scheduling purposes and to summarize (If you read the above, you can understand my motivation for doing so), this year, Sukkot can be broken into three sections. The (work-restricted) first days of Sukkot start Wednesday September 26, 2007 before sunset and, officially end on Friday night, September 28, but since that coincides with Shabbat, they effectively end Saturday night, Septemeber 29th. The (less restrictive) intermediate days of Sukkot (really start with Shabbat on the 29th, but Shabbat has its own restrictions) end on Wednesday night, October 3rd. Prepare an Eruv Tavshilin during daytime on each of the Wednesdays before Yom Tov. Order any hardware for the sukkah that is broken or missing. Was it windy last year? Do you need more scach? Order it now. Make sure the pathway to the sukkah is company ready (at best) or not a hazzard (at a minimum). If your rabbi/shul/minhag allows drinking on Simchat Torah, stock up on liquor. Plan for simpler foods and fewer courses on Simchat Torah. People will be hungry, but patience will be at a minimum. There are likely to be many leftovers available by then. Get real. This is a month with 3 "Three Day Chag"s and 2 fast days in four weeks. There are going to be some mistakes. There are going to be some broken dishes. At least one kugel will burn. There will be stress. Expect it, and you can meet it, face-to-face. The stress that sneaks up on you is the real villian. Try to find time to think Yomim Nora'im (High Holiday) type thoughts. The food is important, but it isn't about the food. If a guest (or anyone) offers help, accept it. This is a marathon; we have to pace ourselves. If nobody offers, ask for help. Prevent burnout by firmly (but kindly) demanding that family members give you the help you need, even if that help is in the form of, "Please, will everyone leave the kitchen for a couple of hours so Mommy can keep track of the number of eggs in her recipes." Don't get overwhelmed. Remember to breathe, and take breaks. The goal is not to be a drudge, even though some drugery is called for. Find ways to make tedious tasks joyful as possible, such as listening to music, setting aside a favorite yom tov treat just for Mommy, using a headset telephone to phone a friend while chopping vegetables, etc. If you have a like-minded friend, even if across country or the world, make time to call and set a kvetch timer. 20 minutes of shared hassles become anecdotes, not whining. Made better in the retelling, just to know you have an audience, even a retrofit one. Close the kitchen to snackers during cooking hours. It's helpful to have something they can take elsewhere - like outside - to nosh. In your copious spare time (ha!) review the laws of cooking on Yom Tov. Knowing what you can prepare during the holiday and what needs to be done before-hand will help with prioritization. If possible, bulk-prepare ingredients with electric devices before the holiday begins, rather than spending holiday time preparing foods manually. For example, I like to measure the flour for certain recipes by weight. If I know in advance that I'll be making certain recipes on Yom tov, it helps to have it weighed in a paper bag before chag begins, rather than having to approximate the amount of flour in a manner I'm not accustomed to using, that will likely yield unpredictable results. If I need matzah meal, I could bang it up with a rolling pin on Yom tov, but I'd rather prepare some in a minute and a half in the food processor the day before. I can mix cake batter by hand, but much prefer to use the standing mixer, even if it means freezing the cake for part of the week. Stock up on staples of paper goods - garbage bags, paper towels. They're not perishable. Tearing paper towels is a great task for little kids. It's tedious and time consuming for adults, but the kids like it. They can't fail at this: If the towel tears, who cares? Now that school's almost in session, the kindergarten teachers will appreciate the cardboard tubes. Make sure there is enough kleenex (doubles as pre-torn toilet paper) DIAPERS and wipes. Must keep up with laundry, or have a strategy for doing so during the few scarce weekdays in September. September is nuts this year. Imagine the calendar in the food processor. This coming Sunday is the last normal weekend until the second week of October. The Sunday after Rosh Hashanah, September 16, 2007, is a fast day, so don't plan any heavy lifting for that day. Realize that the all the schools, community organizations and birthday parties will pile on on that Sunday after Yom Kippur. Plan a Defensive Calendar Stategy now. At least (for those of us in the USA), we have some Sundays for catching up. Resist the urge to schedule much on any of the Sundays until 10/14 because there will be much to do. "One Company Meal Between Sleeps"
We started a family policy over a dozen years ago, of "one company meal between sleeps." This means that (unless it is an emergency) we invite guests for either lunch or dinner on a given Yom tov day, but not both. This allows us to relax with the guests, and experience the meal without hurry and without burnout. Before we instituted this policy, sometimes we were still clearing the table from lunch when the dinner guests started to arrive. Yom tov meals are supposed to be served b'simcha, not through clenched teeth. If the schedule is too grueling, then the fancy roast might as well be gruel. Deciding far in advance which meal each day will be the "one company meal between sleeps" allows the family to accept invitations to be guests at someone else's table for the other meal. Accept invitations sparingly, to keep the fatigue to a minimum. Being a guest "on your best behavior" can be tiring, too. We like to serve a light menu at the family-only meals. This lightens the burdens of cleaning and setting up, and it allows time for naps and digestion. It also gives the children an opportunity to share their divrei Torah at a private meal. Emphasize the parts of entertaining (and of the whole holiday season) that you like best, and that give your family the most joy. Yes, all that is required is required. But extra flourishes should come from the heart. The Pareto Principle applies to kugels and honey cakes, too. I keep a binder for each major holiday season, where I put the lists, a few package labels, my notes, receipts, and recipes pertaining to that holiday. I have fun with them, giving them titles and a colorful picture on the cover. Some of the titles include "There's a Leaf in My Soup: A Manual for Sukkot", "MiShenichnas Adar: A Manual for Purim", and "You're Not Making This Fun For Me: A Manual for Pesach". People invariably exclaim, "Oooo, you're so organized!" when they see the manuals on the shelf, but really, they're just a place to hold a random bunch of printouts and receipts. Half of them have almost no internal order at all. Toss one together, and see if your guests don't say the same thing. For menu inspiration check the various Kosher Cooking Carnivals. Print a few extra recipes that appeal to you and toss it in the appropriate folder/binder/shelf, if not for this year, then maybe for the next. When Tishrei is over, sit down and do a complete "brain dump to paper" about what worked and what didn't. Put this list, along with the receipts, recipe print-outs and whatever other holiday planning detritus you can find, in the binder. Next year, you'll be another year wiser and more experienced, and you'll have the binder as evidence to prove it! Save receipts. They can help make up next year's shopping list. 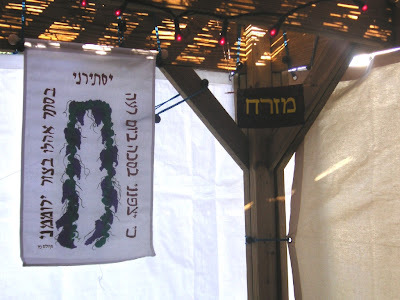 Simcha, the watch-word for Sukkot, is roughly translated as joy. Rather than a hedonistic joyfulness, simcha is the expression of the joy of engaging in mitzvot (G-d's commandments). Sukkot is called "Zman Simchateinu", the time of our joy. Similarly, Passover is called the "time of our freedom" and Shavuot the "time of the giving of the Torah". All three of pilgrimage holidays are supposed to be joyful, but simcha receives extra emphasis on Sukkot. Tradition's formulae for jumpstarting the holiday simcha involve sanctifying physical enjoyments, such as drinking wine, eating meat, and receiving new clothing or Jewelry in anticipation of the holiday. Much is written (of course) from a Jewish perspective, about the meaning and implementation of holiday simcha. However, I enjoyed some recent insight on this from a secular source. Gretchen Rubin, a writer empirically developing her own personal Theory of Happiness, blogs about her "research" experiences at The Happiness Project. Last week, she posted her "Third Splendid Truth". 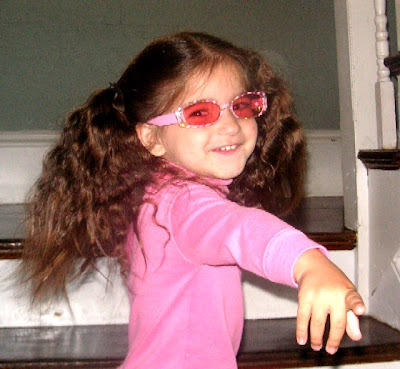 She states that happiness is a four-staged process: anticipation, savoring, expression, and reflection. 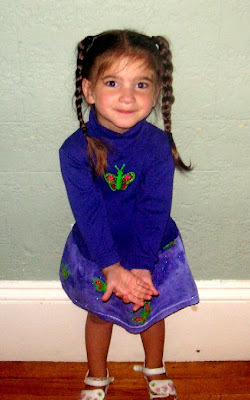 Her model can give us a hint about maximizing our holiday simcha (a concept not identical with happiness, but work with me here...) 'Anticipation' and 'expression' are nearly unavoidable, given all that must be done to prepare for and accomplish the tasks required on the holiday. 'Savoring' and 'reflection', however, require conscious effort lest they be neglected. 'Savoring' can't happen in an atmosphere of burnout. Savoring is the antithesis of stress. I posit that efforts undertaken to reduce stress are a necessary part of the mitzvah of simcha on the holidays. The point of all this list-making is to reduce stress. The lists are tools that are intended to help with at least three of Gretchen's four requirements. 'List-making is nearly synonymous with "anticipation". Lists give us control and reduce stress so that the essence of the holiday can be savored. Reflection is inherrent in the debriefing, note-taking, and list-making that recommended after the holiday events. May your name be inscribed and sealed in the Book of Life and for all the best in the coming year. by Juggling Frogs at 10:08 AM 9 comments, so far. Add yours now!